Clay has been used for centuries to beautify and refresh when used as a facial mask. One of the most beautiful women in history, Cleopatra, used clay taken from the Nile River and the Arabian Desert as part of her skincare regime, and ancient German and Roman spas also used clay skin masks, packs, drinks and other treatments. The use of clay with apple cider vinegar can be dated as far back as the 16th century, when a French priest, Kneipp, used this combination with his natural treatments using clay packs and poultices. The Aztec Secret Indian Healing Clay face mask allows you to enjoy the benefits of clay in your own home. The Aztec Secret – Indian Healing Clay, the pore-minimizing and -clearing mask, is Amazon’s best-selling beauty product that’s practically spawned its own cult. Amazon users and YouTubers have been giving the product rave reviews – it has more than 11,500 reviews on Amazon, 71% of which are five-star reviews. This minimizes the second most-reviewed item, Crest Whitestrips , by more than 3,600 reviews. This innovative face mask is gaining popularity as the “world’s most powerful facial,” and it’s only $8.80 for a 1-pound jar. In the world of $200 skincare and scientifically tested ingredients, the product that has been everyone’s latest mask obsession is a humble one. ANYWAY, you’re probably wondering what makes this face mask so much better than other similar products currently available on the market. For starters, the label promises that you’ll “feel your face pulsate” when you use it. PULSATE!!! NOTE: That is, it will if you follow instructions printed on the label. The clay comes in powdered form, which is meant to be mixed with apple cider vinegar in a non-metal bowl until it becomes a spreadable consistency. However, that’s a small ask from the self-proclaimed world’s most powerful facial. 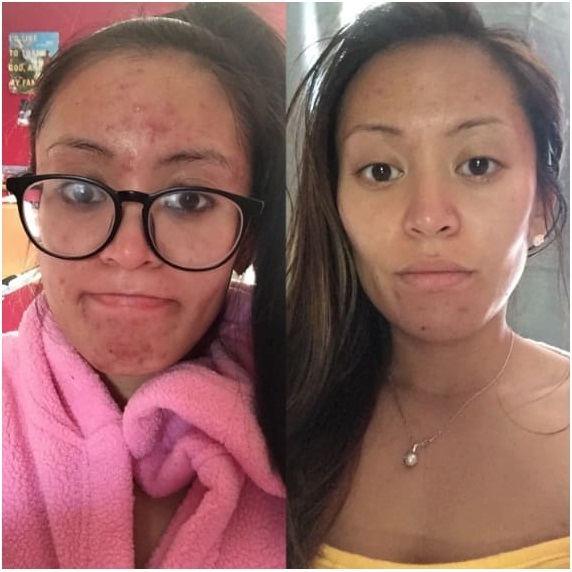 This mask is also getting rave reviews from actual customers who claim it has helped clear their acne. 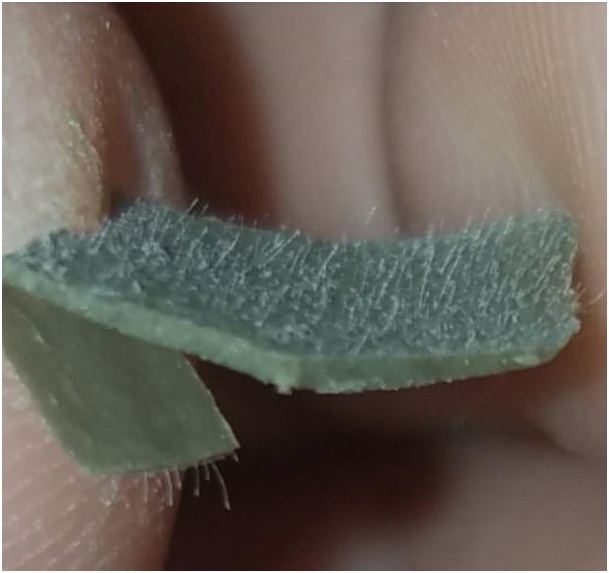 Some users have posted incredible before-and-after photos which are making my heart sing and my eyes tear up with joy. It only took four days for this customer to see a noticeable improvement in her complexion. “This will forever be a staple for me. I went through a horrible breakout and decided to use this. In six days, my skin was significantly clearer. I leave it on for about 35-45 minutes then rinse off with warm water. This is definitely worth the investment. An all natural skin clarifier and acne zapper — what could be better? The thing is, you have to keep with it, doesn’t work with one or two uses. Be patient and drink lots of water as well. Hubby uses it also and we both will be supporters for life!” Amazon user DJ Freddie W., whose photos you can see above, said in her review. Okay, fine, here’s one more photo showing results of using the mask over a four month period. This photo is honestly making me believe in miracles. 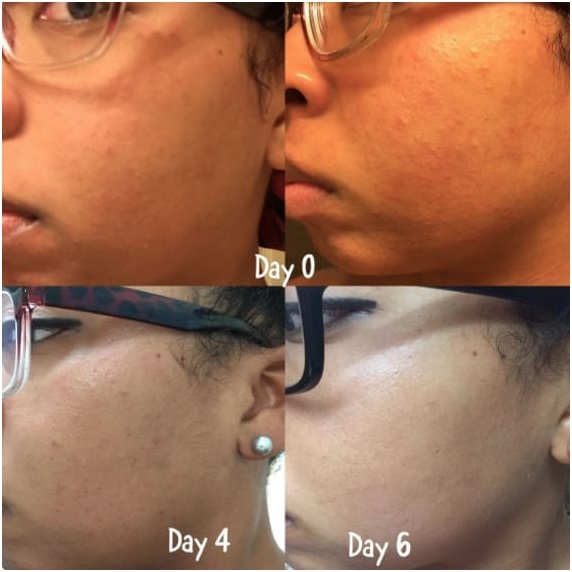 “I’m 24 and this past January my face started breaking out with cystic acne. Naturally I immediately went to the dermatologist, and then my acne got even worse (I wanted to treat acne on my chin but then it started spreading to my forehead after using the prescription topical creams they gave me). In desperation I started looking up other treatments and came across Aztec healing clay. I stopped using all the topical stuff given to me from the dermatologist and used the hearing clay every other day (started once a week then upped it to every other day). In my picture you’ll see picture to the left which was taken in February and the picture on right taken yesterday. I strongly recommend Aztec healing clay, it has done more wonders than I could’ve ever imagined (and you can’t beat the price!!! ).” — the Amazon customer above said in her review. Important Note: The mask seems fairly powerful based on the reviews. That’s why it’s highly recommended to test it on a small area of your face to see how your skin reacts to the “pulsating” effect first. Aztec Secret has become an unlikely phenomenon, and if you are struggling with acne, dull skin, blemishes, or just want some deep ~cleansing~, this is the face mask for you!